Chicken soup, of course! TheDaughter managed to slurp up and hold down some of the broth. Barbecued a few skirt steaks (for the rest of us). Used leftover skirt steak to make sliders. Nothing fancy, not even a recipe: using fingers (preferably clean) or two forks, shred the skirt steak. Pile the shreds on sliced-open dinner rolls (we used whole grain to be healthy), drip on some honey-barbecue sauce, then top with cole slaw. Sever with remaining cole slaw along with potato salad on the side. Note -- you can use store-bought salads; I'll never tell. Disclaimer -- this week's photos are brought to you by theHubby's cell phone and the bare-bones photo mutilating editing software that came with his laptop. Very dark cooking utensils provided by the newly-weds-to-be (easier to photograph cookware will be on their registry ... I hope). We are visiting the Left Coast to help theDaughter, who is undergoing round 4 of chemo. AlmostSonInLaw purchased a honking large bar of Valrhona chocolate for me to make something out of it with (I didn't major in English, Dear Reader ... chill). So I made a batch of honey vanilla pudding. daDaughter doesn't care for chocolate.. Chocolate pudding will be made later. 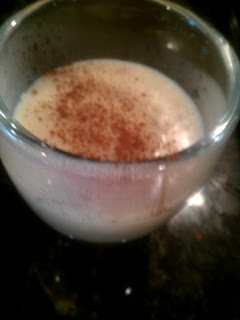 Honey Vanilla pudding is a step easier since no chocolate needs harming in its production.